D’Agostino Well & Water Services installs Well-Rite holding tanks. Well-Rite tanks are quickly becoming the industry standard. This tank is loaded with features that distinguish it from the competition. Solidly constructed with a welded, stainless steel connection, the Well-Rite Series puts the tank in water tank. Well-Rite tanks are distinctly designed with a patented and innovative controlled action diaphragm (CAD), which eliminates coatings, liners and plastic bladders. The CAD is surrounded in a pre-pressurized atmosphere that reduces condensation and forces the diaphragm to expand and contract the same way, every time. A patented controlled action, double diaphragm assembly completely contains drawdown water. The water chamber does not chafe on the tank wall. This unique diaphragm design is constructed with an FDA approved, high-grade butyl rubber compound. NSF certifies Well-Rite tanks as conforming to standard 61 for drinking water system components. The CAD system is anchored by a stainless steel water connection which is totally lead free, and NSF approved for the highest sanitary standard. A full flow stainless steel port diffuser directs water flow upward and outward while firmly locking the lower diaphragm in place. We guarantee all installed tanks for 1 year parts & labor. Plus all of our quality tanks are backed by a five year written, limited warranty. 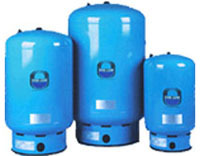 Well-Rite tanks are quality tested at four different stages on the production line. Tests include helium and high pressure tests to ensure the structural integrity of every tank.